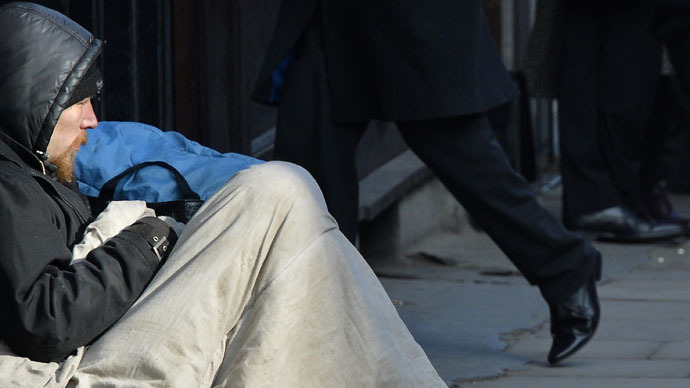 While homelessness in the UK has increased by 6 percent in the past year, Oxford City Council has announced plans to ban rough sleepers under a new Public Spaces Protection order. According to the Oxfordshire Community Foundation, Oxford has more rough sleepers than anywhere else in the UK apart from central London. The council has proposed bans on “anti-social activities” such as rough sleeping, public drinking, pigeon feeding, busking and begging in Oxford city center. An Oxford City Council spokesman told The Independent that only people “who are already receiving support and accommodation” will be affected. Rough sleepers with a bed available to them in a hostel or shelter “could be fined” and those without shelter would be left at peace. @OYDOxford Surely these proposals are targeting beggars who are using rough sleeping as part of their 'story'? Genuine RS won't be affected? “The experience of the team [working with homeless people] is that a small number of people continue to beg and sleep in the streets despite receiving support and having been allocated accommodation,” he said. The “outrageous” proposals have attracted major opposition. Campaign group On Your Doorstep launched a Change.org petition, which quickly attracted more than 50,000 signatures. “We should be making the lives of these people easier, not worse, because homelessness is a big issue in Oxford,” he said. He said Councilor Sinclair’s statement on making Oxford a world-class city “smacks of [a] beautification project. This is a living, breathing city – not a museum,” he said. If Oxford wants fewer homeless people on the streets, they should “increase access to accommodation” not “misery and grief to push them away,” Shilbli said. Oxford council make life more difficult for the homeless.as if there suffering isnt already enough.its inhuman ..
“Oxford council [makes] life more difficult for the homeless, as if there suffering isn’t already enough. It’s inhuman,” one user said. “To ban and criminalize ‘rough sleeping’ is to criminalize deep misfortune,” another user said.